Written by: Usman Ahmad on January 19, 2019. Can India and Pakistan bring down their ‘Berlin Wall’? On November 28, Prime Minister of Pakistan, Imran Khan, performed the ground-breaking of the four-kilometre-long Kartarpur Corridor. In his address at the ceremony, PM Khan said both the countries cannot move forward without breaking the chains of the past. He cited the examples of France and Germany, the European countries that have been bitter rivals for long and have also fought many wars. “If France and Germany can move ahead while making a union, why can’t we… the Pakistan Army, national institutions and political parties are on the same page, we want to move ahead, we want a civilised relationship, only a leadership with determination is needed on both sides of the border to solve the issues,” he said. He added that millions of people lost lives in wars between France and Germany but today they have opened borders, they could not even think of going for a war now keeping in view their connections of business and investment. Amid the friction prevailing between South Asian neighbours India and Pakistan, the launching of the Kartarpur Corridor is nothing less than a paradigm shift for this region. Considering that both countries do not get along most of the time, the breakthrough is no less than a miracle. Performing the ground-breaking ceremony, Pakistan’s Prime Minister Imran Khan called it the ‘corridor of peace’ and urged both countries to ‘move forward and break their chains with the past,’ following the example of France and Germany who fought many wars but have amicable relations today. Certainly, after centuries of hostility and armed conflicts, France and Germany, the two major powers of Europe, are at peace and their mending of fences is central to the success of the EU. Whereas India and Pakistan, since their emergence as new states in August 1947, have been living as hostile and belligerent neighbours; resulting in the rupture of Saarc and marginalisation of South Asia in the realm of global power dynamics. If France and Germany were able to mend fences in the historic 1963 Franco-German Treaty of Peace and Cooperation, India and Pakistan are bogged down on issues which since 1947 till today are responsible for vitiating their past, jeopardising their present and putting a question mark on their future. There is no harm in imagining and visualising things but one needs to consider ground realities which militate against seeking relevance of Franco-German model for Indo-Pak peace. Three contradictions exist when one tries to apply the model in the context of India and Pakistan. First, the absence of a leadership like French president Charles de Gaulle and West German chancellor Kurt Adenauer who acted as a catalyst in making history by signing the historic Franco-German Treaty of Peace and Cooperation in 1963. The Gordian knot in the centuries-old animosity and hostility between the two neighbuors was cut because of the leadership of France and Germany which decided not to carry historical baggage to their future generations. Unfortunately, in case of India and Pakistan, visionary personalities are missing as the leadership of the two countries since 1947 never seriously tried to mend fences and peacefully resolve issues responsible for the outbreak of wars and armed conflicts that have resulted in the deepening of poverty as well as social and economic backwardness. Second, France and Germany created institutions to strengthen the process of reconciliation at the governmental and non-governmental level. For instance, the Office of Commissioner for Franco-German Cooperation was established for coordinating political relations between France and Germany and to promote societal exchange of the two countries. France and Germany also established Franco-German Council of Ministers on the occasion of 40th anniversary of Elysee Treaty on January 22, 2003, for working on joint projects. Furthermore, at the summit meetings, which took place between the governments of France and Germany at Potsdam in July 2005 and Berlin in March 2006, the two sides agreed to a more structured collaboration through joint laboratories for research in biology and information technology. But in case of India and Pakistan, absence of institutions to build trust and confidence and promote cooperation at the governmental and non-governmental level is a bitter reality. Harsh visa and travel restrictions impede any initiative which tries to institutionalise the process of peace between New Delhi and Islamabad. Indo-Pakistan People’s Forum for Peace and Democracy, Karachi-Mumbai Initiative and many other institutional efforts under track-II diplomacy failed to take off because of non-cooperation and hostile attitude of the regimes of the two countries. Third, the visionary leadership of France and Germany, in order to get over the hangover of the past and proceed for a better future, focused on the youth population of the two countries. They decided to establish Franco-German Youth Office which offers more than 9,000 subsidised programmes each year for the age group of 13-30 years involving exchange of students of the two countries at the school and university level so as to eradicate enemy images and promote positive and forward-looking approach among the youths of France and Germany about each other. Instead of investing on their youths and empowering them to pursue an innovative approach for peace in the region, India and Pakistan are seldom interested in engaging the future of their countries for unleashing the process of peace and reconciliation. Enemy images, paranoia, mistrust, suspicion and ill-will still shape the minds of the youths of India and Pakistan against each other. Yet amidst the environment of pessimism prevailing in Indo-Pak relations, some of the initiatives to promote goodwill and friendship among the youths of the two countries are Indo-Pak Youth Forum for Peace based in Lahore; Youth for Peace International based in New Delhi; Bargad Foundation, a youth, peace and development organisation based in Lahore; Aaaghaz-e-Dosti, an initiative to promote better understanding between the youth of Delhi and Karachi, etc. If India and Pakistan want to learn from the process of Franco-German peace and reconciliation, the two countries must promote exchange of youth delegations and take steps to erase those items in history textbooks which deepen mistrust, suspicion, paranoia and enemy images in the minds of the youth. It is time that the leadership of India and Pakistan, whether at the governmental or the civil society level, took practical steps to reduce, if not eliminate, more than seven decades of animosity. Easing travel restrictions, particularly for the youth, will go a long way in building bridges of peace between the two countries. Franco-German cooperation is a success story because those at the helm of affairs were not a hostage of the past but pursued a forward-looking approach which not only established long-lasting peace between the two former adversaries but also helped unleash the process of European integration. A corridor to lasting peace? For the first time in a long time, neighbours and arch-rivals Pakistan and India have come to an agreement on something which would positively impact people living on both sides of the border and has offered a sliver lining of hope for attaining lasting peace. Following signals from Islamabad, New Delhi approved the development of the Kartarpur Corridor up to the international border with Pakistan. This corridor will see Indian Sikh Yatrees granted visa-free entry into Pakistan for the pilgrimage of Sikh religious and historic sites such as the Gurdwara Darbar Sahib Kartarpur. Pakistan’s readiness to open the border first came to light when Indian cricketer Navjot Singh Sidhu, who had been invited to Pakistan to attend the oath-taking ceremony of his cricketing friend PM Imran, blurted it out following his now-famous warm embrace of Army Chief General Qamar Javed Bajwa. As per Sidhu, his source for the news was the COAS. Gen Bajwa, for his part, reacted to recent events along the troubled border and provocative comments from senior Indian military officials by urging our eastern neighbours to “place their stock in peace and progress through dialogue.” Pakistan and India not only share a border but also history, language, people, culture and religious sites. Allowing people from the other side to visit, if only for pilgrimage, is a key first step to peace because it creates space for the ordinary folks on either side of the border to interact with each other. It, thus, lets people learn about not only what makes them so different from those living across wired and guarded borders, but also what makes them similar. 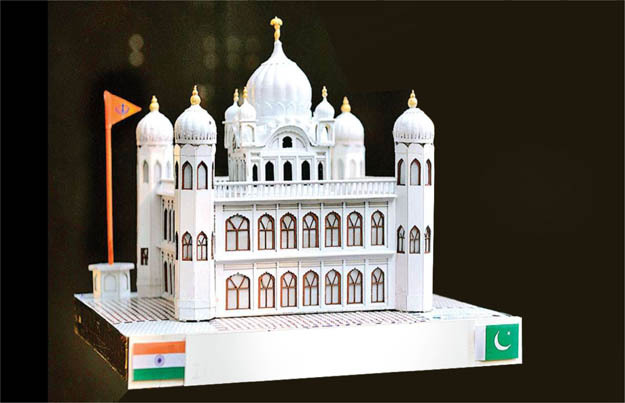 Kartarpur corridor would be a border-corridor between India and Pakistan as it will connect the Sikh holy shrine of Dera Baba Nanak Sahib in Indian Punjab with another Sikh holy shrine of Kartarpur Sahib in Pakistani Punjab. Gurdwara Kartarpur Sahib is located in Shakargarh tehsil of Narowal district, around 120km from Lahore. It is located across the river Ravi, about four kilometres from the Dera Baba Nanak shrine. It was established by the Sikh Guru in 1522. The gurdwara has historical significance for Sikhs as Guru Nanak, the founder of Sikhism, spent last 18 years of his life here. The original Gurdwara Darbar Sahib Kartarpur was destroyed by floods. The gurdwara was reconstructed between 1920 and 1929 by the then Maharaja of Patiala, Bhupinder Singh Bahadur, for Rs135,600, and since then has been maintained by the Evacuee Trust Property Board (ETPB). Sikhs from all over the world visit the gurdwara, though it remained shut from 1947 to 2000. The Kartarpur border issue emerged in news headlines when minister from Indian Punjab Navjot Singh Sidhu joined the oath-taking ceremony of the Prime Minister of Pakistan Imran Khan in August. During the ceremony, Pakistani Army Chief General Qamar Javed Bajwa conveyed Sidhu that Pakistan was going to open the visa-free Kartarpur border for the occasion of the 550th birth anniversary of Baba Guru Nanak. Pilgrimages between India and Pakistan are governed by the 1974 Protocol on Visits to Religious Shrines, which includes a list of shrines in Pakistan and India open for visitors from the other country, and for which visas are required. This post has been seen 35926 times.